ZE03-H2 Gas sensor can be used to measure Hydrogen concentration in atmosphere. This is an Industrial grade sensor and is are very easy to interface to your Micro-controller, Arduino as well as Raspberry Pi as they have linear Analog output as well as UART output (3 volts). 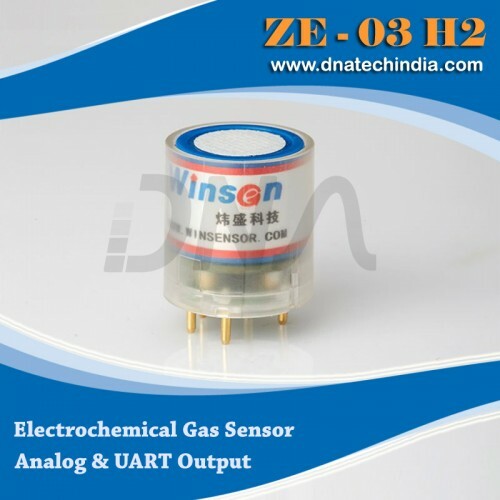 ZE03 Series of Gas Sensor Modules by Winsen is a general-purpose and high-performance electrochemical module. It uses three electrodes, electro-chemical gas sensor and high-performance micro-processor. By using this GAS Sensor you will be able to Monitor concentration of Hydrogen gas. It is with built-in temperature sensor to make temperature compensation, which makes more accurate to detect Hydrogen gas concentration. It has the digital output as well as analog voltage output at the same time which facilities the usage and calibration and shortens the development period. It is a combination of mature electrochemical detection principle and sophisticated circuit design, to meet customers different detection needs.